POUZZA VII is a punk rock music festival set to take place in downtown Montreal from May 19 to 21st 2017. Over 150 bands will perform at our outdoor stage and in different venues all within walking distance from each other. 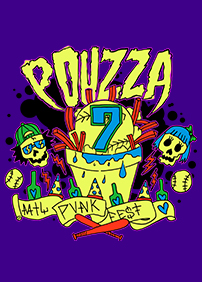 The POUZZA FEST goal is to showcase the sense of community which has been at the core of the punk rock scene from its very start. We wish for this event to be a huge party for everyone involved. We want every attendee to be able to see their favorite bands, to discover new ones, to meet new friends and to experience an all-around unique weekend in the wonderful setting that is Montreal. Lagwagon is a Californian punk rock band originally from Goleta, just outside Santa Barbara, California. They formed in 1989 and went on hiatus and reunited several times over the years. Their name comes from the band's tour van, which can be seen on the back cover of their 1994 second album Trashed. Now approaching 15 years of hammering out bombastic tunes everywhere from dive bars to festival stages to European concert halls, The Flatliners hold fast to the DIY punk-rock ethos that has been at the band’s core since its genesis. The band came out swinging with youthful exuberance on their debut record, Destroy To Create, in 2005, and they’ve honed their anthemic style with each subsequent release: The Great Awake in 2007, Cavalcade in 2010, Dead Language in 2013 and Division of Spoils in 2015. If, as the saying goes, life is less what happens to you and more how you deal with it, Red City Radio have succeeded in spades, insatiable in their heart and singular focus. Since forming in 2009 in Oklahoma City, Red City Radio have proven their punk-rock proficiency, turning in beloved albums (2011’s The Dangers of Standing Still and 2013’s Titles) and winning over fans around with the world with a sweat-soaked, raved-about live show honed by years of touring along acts like Strung Out, New Found Glory, and Anti-Flag.